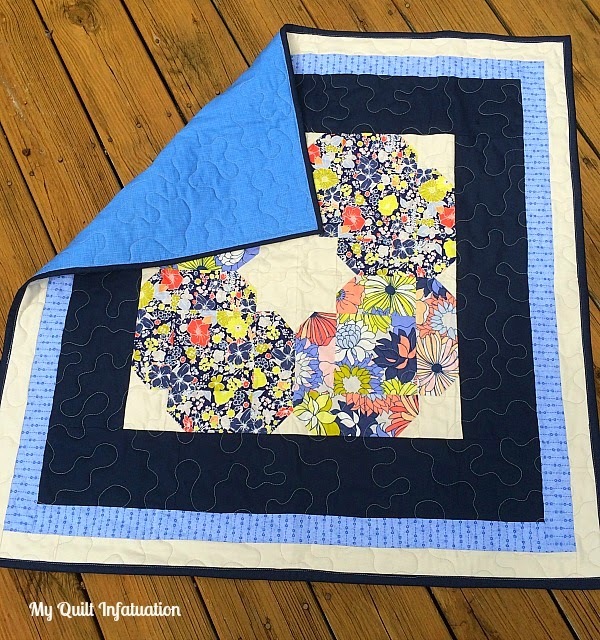 My Quilt Infatuation: Labor Day Giveaway! Good morning, and happy Labor Day quilty friends! I hope you are enjoying your Labor Day as much as I am. I am currently still lounging in my pajamas with my coffee in hand, planning out my next quilt. Can it really get any better? I have been pretty productive this weekend, and finished my Stacked Squares quilt yesterday. We've been getting lots of rain, so I hope it will dry out enough to squeeze in a photo shoot. I do have a couple of things to share with you though. A couple of weeks ago, I finished up a couple of donation quilts that I'm giving to the local children's hospital for preemies, and I just realized that I never posted about them! This rainbow quilt was so quick and fun! When I made the backing for Shattered Rainbow, I ended up with a perfect sized piece of each fabric. I hated to put them into my scrap jars, so I decided to make a mini rainbow quilt, and give it a little bit more interest by doing a strip and flip. Since these preemie quilts are small (36ish inches), I did solid backings on them, and I absolutely LOVE the rainbow flower print I found for this one! The front is so straight and square that I think it's the perfect compliment! You may remember my second preemie quilt from my stop on the Fat Quarter Style book tour. I made the Tapestry block, and although I would have loved to make an entire quilt, my beginning of school schedule just would not accommodate. 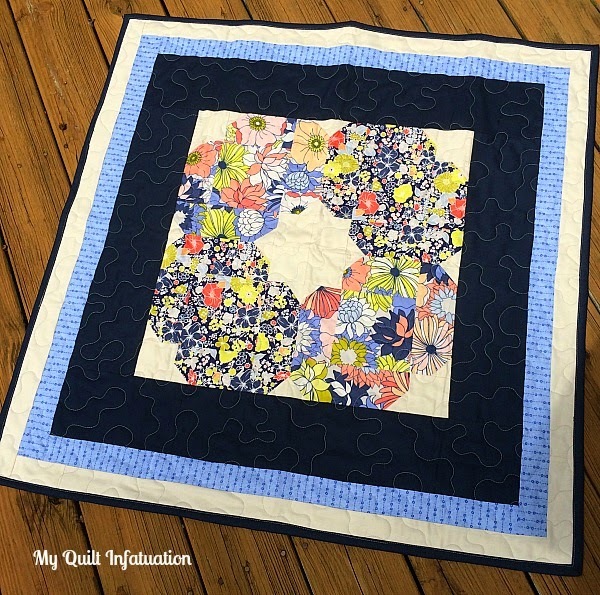 I think the Chic Flora fabrics look great in this block, and I like the style of the block with the borders. The shape of the block, with the star in the middle almost have a medallion feel. With the borders, it is a perfect size for a preemie quilt, and I was able to use some Kona Navy that was in my stash. This one got a sketch print backing in that pretty shade of cornflower blue. Since these are so small, I didn't label or name them, which felt totally wrong. You know I always label and name my quilts! Okay, y'all! Ready for the giveaway? Amy at Dragonfly Fabrics is giving away $25 to spend in her shop! The timing is perfect, because she is also extending her Labor Day sale through Wednesday, where there are coupon codes for 20% off of everything in the shop. Check out some of her gorgeous fabric lines. Keep in mind that these are just a few! To enter the giveaway, leave a comment on this post, and let me know how you would spend the $25. Easy peasy! I'll use a random number generator on Wednesday afternoon to choose the winning comment and announce the winner on Wednesday evening's Needle and Thread Thursday post. 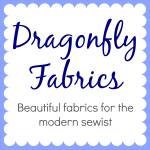 The button for Dragonfly Fabrics is always on my left sidebar, but I'll also add it here so you can easily pop over and browse! Good luck in the giveaway! Beautiful quilts, Kelly. I'm sure you will give comfort and hope to some parents with the quilts. If I had $25 I would buy fat quarters of the Bella collection. Amy has so many beautiful fabrics, it's hard to choose. I am in the early stages of learning how to quilt. I made my son a rag quilt out of old jeans as my first. So I would use the $25 for some fat quarters. After browsing the website I think the Up Parasol Pink Fat Quarter Bundle might be something I'd pick. So hard to choose just one. Feather River looks like something I don't have in my stash. Always enjoy seeing your Kwilts. Okay, that Caravan Dreams is amazing but I'm loving the Owl Bullseye Quilt Kit too. So many beautiful things. Just caught your Easy Peasy Chevron Quilt tutorial and this is definitely my next quilt. Thank you! I would love to get some of the ampersand or eclectic elements. Thanks! I'd get some fun, fall-y time fabrics for some cold-weather outfits for my daughter! Ooooh just browsing I've spent that $25 many times over :-D think I would have to eenie meenie to narrow it down. Thank you and Dragonfly Fabrics for the giveaway! I'd get some Up Parasol-very pretty fabric. I love that Dragonfly has the option to order fabric samples. Love the Rainbow Bridge quilt! My Solids have taken a big hit this summer, so I really need to replenish my stash....the $25 would surely help! I would invest in more thread and maybe some low volume fabric. Hi, I like "Up Parasol Pink Fat Quarter Bundle", as a selection! I like your rainbow quilt, I pinned it...hope you don't mind (It seems like a quick one to make). I need a backing for a quilt I am working on and I see lots of prints in their shop that will work. Thanks for the chance! Loving the Winged collection. Thanks for the giveaway! 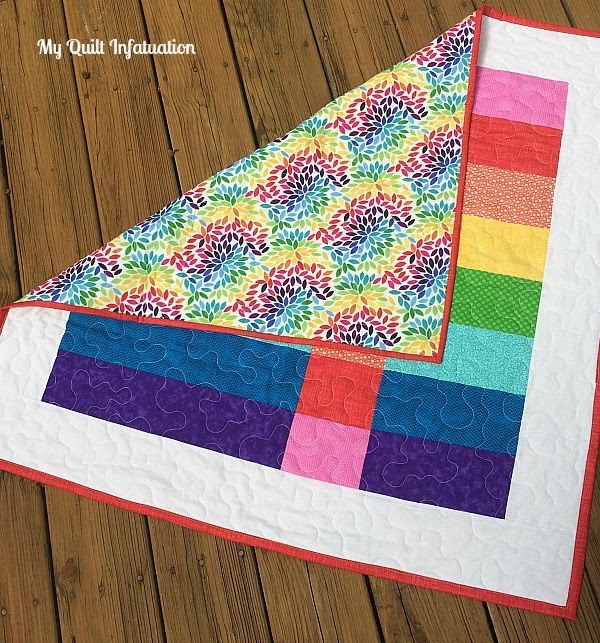 I love the backing for the rainbow quilt! Do you remember what line it is from or the name by chance? I would spend the $25 dollars on fabric for a friend's baby quilt that I am making in the next couple of weeks. Thanks for the giveaway! I would use it to buy some fat quarters I need to re make a quilt pattern I am working on. Thanks for the opportunity! I would choose a gorgeous fat quarter bundle. I would use the $25 to purchase fat quarters for use in a quilt I'll be starting soon as a Christmas gift! I would buy some yardage of Kensington Wallpaper and Sidewalks Geometric. thanks for the chance! Love your preemie quilts. Not sure how you find the time to sew these days! It'd be hard to decide how to spend that, but I really like Meadow by Leah Duncan. Such pretty colors! 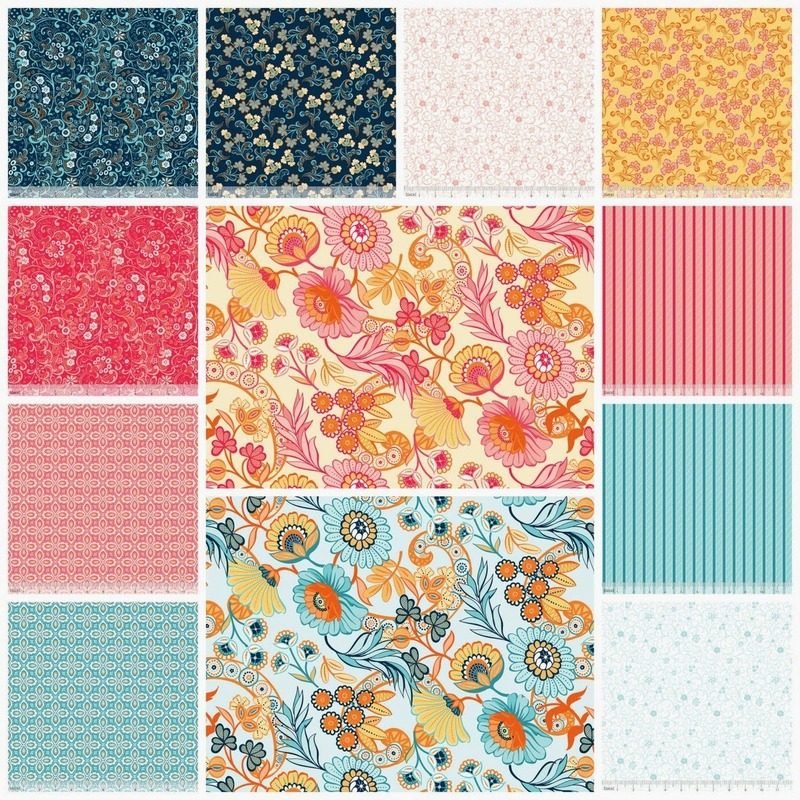 I would choose some fabrics from Acorn Trail or Feather River, both are lovely collections! I'd probably use it to buy the Emmy Grace in Cream fat quarter bundle. Thanks for the giveaway! I'd buy anything by Lori Holt! I would invest in some new fabric in fall colors- oranges, reds, and browns! I would choose the last collection you listed as it's not my regular colors of choice. Love you little preemie quilts. Glad you are enjoying your Labor Day. I'd put it towards an up parasol fatquarter set that I've been wanting for a while now! I would put it towards an Emmy Grace Fat quarter bundle or yardage. Thanks for the giveaway. I would go with eclectic elements. Thank you. I would chose yardage from the Caravan Dreams line. Love these quilts. I would use it to buy some Meadow fabric. I would spend the $25 on fabric to make bags (purses) for a local charity fundraiser in November. I have already made 6 bags. Preemie quilts- what a great way to use leftover fabric! Thanks for the giveaway. I would use it to get the Caravan dreams. I love your preemie quilts - what a wonderful idea! I do love the Emmy Grace in Gray FQ bundle at Dragonfly! Beefing up the basics and blenders so I guess I'd go with that. Thanks for the chance. Oh, I love these quilts! They are both so perfect. 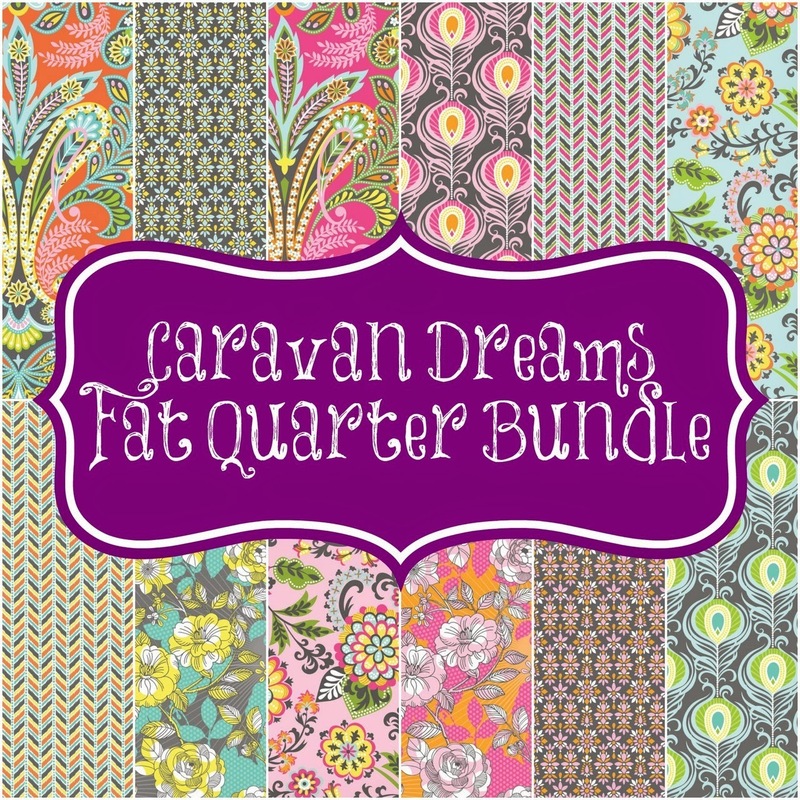 If I won I'd love to get some basic colors in a FQ bundle, but some of those fabrics you shared are amazing and would be tempting...The Caravan Dreams is delightful!! I am looking for a few more fat quarters for some Christmas projects. I'd get some solids to finish some quilts, but I might get sidetracked by some Up Parsol. Thanks for the giveaway! I really like the Plumage prints in the Winged by Bonnie Christine, and I think Itty Bitty Pink in the Hello World collection would make a fabulous backing for something! I'm a sucker for fat quarter bundles - oh, so pretty! I'd have to browse a little longer to decide on which one to pick, and some appropriate backing for it. Delicious fun! I'd get more low volume fabrics for a quilt. I haven't decided on a pattern yet, but I'm saving up for a bed sized quilt. Ooh, so hard to choose! I'd select the True Blue Fat Quarter Bundle to make a quilt for my little guy since I recently made his big brother a red and blue pinwheel quilt. Gotta love coordinating! 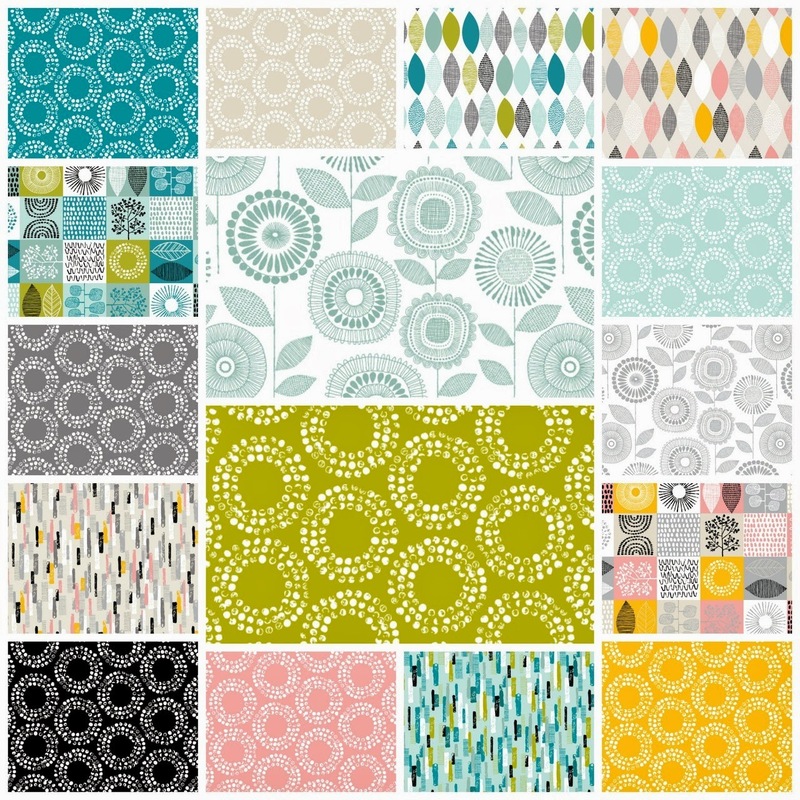 I think I may try some Priscilla large prints by Lila Tueller/Riley Blake (main pink or maybe the white) and then some coordinating solids. OMG I just found the 'Littlest' collection, I just need yards and yards of every one of them!! I absolutely love Caravan Dreams! I definitely get a bundle of that. Thanks and I hope you had a great holiday weekend. Your premie quilts are darling. I love anything by Jessica Swift. that is super easy to answer..... Fabric! I love your preemie rainbow quilt, it is so bright and cheerful. Not to just pick something off the front page, but I do love that Feather River line -- some of those vehicles look like ones we had growing up! And I also like the Ropes End fabric in the sales section. Hmmmm... I would like to look for interesting, low volume prints. That is what I would do. I love your sweet preemie quilts! That rainbow one is the cutest ever. I'm loving those Full Circle blenders in your last picture. I also ran across a cute fabric called "Line Leaf in blue." Lots of great stuff in her shop! I love your rainbow quilt! I would get some Lori Holt "Bake Sale" - Love that! I also LOVE your rainbow quilt!! I love your quilts. The bright color will be perfect. I would buy some Emmy Grace. One of my favorites at the moment. I'm not sure which fabrics I'd pick! Your preemie quilts are gorgeous! I'd choose some Koi yardage by Rashida Coleman Hale if I were the lucky winner. Thanks for the great giveaway! I really like the Littlest collection! Thanks! Love the Grey Abbey Fabric. So hard to choose - maybe some Shapes of Spring?? I'd use it to add more fabric to my stash of course! Thanks for the chance. I would get Shapes of Spring. Had not seen that collection. I have been eyeing Sweet As Honey - I think I would put it towards that! I'd love to get some of the Leaf print from Bark and Branch, as well as some pieces from Meadow, by Leah Duncan. miller print our daughter picked for our newest grandson due at Christmas. I'd buy some leah duncan fabric - not sure exactly what I'd do with it, but I just think it's so gorgeous! i would love some Feather River - perfect 'boy' fabric! I would have to get some of the Lulu in Freen ! A lot of the materials in here I love! I really like the Babbling Brook prints, but I need need some solids back in my stash! I have not used Riley Blake solids that I recall & I would love to try them. Thank you Kelly! I love the quilts. I would probably get a fat quarter bundle of Modern Lace. Thank you for the awesome give away! I would use it to add to my stash of solids. i would use my gift certif on a winged fat qtr bundle. I'm loving the Caravan Dreams, actually. That one print reminds me of a peacock feather, my fav. Thanks for the chance! You've sold me on Caravan Dreams... love the colors and the mix of prints! Thanks for the chance. All the fabric is so pretty. I think I would get the Emma grace fat quarter bundle. I need border and backing fabrics for two quilts. Soft green for one, and dark green for the other. So fun to be able to choose. It would hard to choose! But I think I'd go for either a fat quarter bundle or some of the great tonal prints. Thanks for the giveaway! Perfect timing on your giveaway -- THANK YOU!!! I've started making preemie quilts for the Ronald McDonald House and "tag along" quilts for their siblings. This would be an extremely helpful prize to win. My stash is short on green tone on tones. Would love to find some good fabrics in the green family. I would jump from piece to piece until I would finally have to just point and order! Gorgeous stuff!! Those are such cute premie quilts. I have made a couple of baby quilts, but never seem to get a picture of them before they are given to our NICU unit. I laughed about you in your pj's late on a holiday morning. No it doesn't get any better than that!! Have a great week and thanks for the chance at the giveaway. The London Dress pattern and some Dear Stella fabrics, as I have none in my stash. Thank you for sharing, you are awesome! I am working on my kid's donation quilts now. Thanks for some quick inspiration. I would use the $25.00, if I was the lucky winner, to buy some low volume, text prints or solids fabrics. All of which is lacking in my stash. Oh, so much lovely fabrics! I would choose a FQ bundle, Autumn Harvest bundle. Thanks for a great giveaway! I would buy some of that so-cute bake sale line, which is on sale(!) and maybe some yellow and lavender chevron! Love your preemie quilts!!! I would take advantage of the sales and get some fabric for baby quilts... I have 3 friends expecting!!!! I would get the ampersand fat quarter bundle. I love your rainbow quilt! I really need to make something using that technique someday. Maybe with a little but of Up Parasol from Dragonfly Fabrics? I would get yardage of the Ampersand fabrics. All the pretty fabrics ... pretty sure that's more than $25 but it would be a great start! 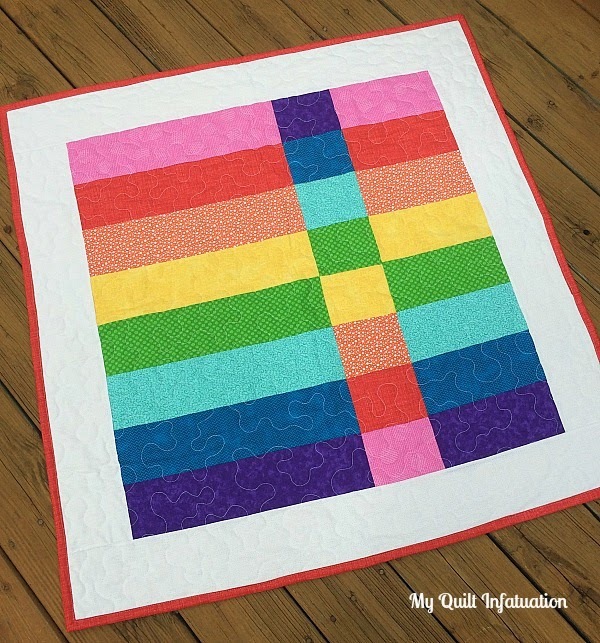 Very cute rainbow premie quilt. Love the backing! As for what I'd get if I won -- I am loving the Shape of Spring fabrics. Probably those, but some yardage of Kensington Cottons would be an option as well. I would buy some yardage would love to get some retro looks! I'm thinking I'd buy some Meadow by Monaluna, but don't hold me to it!! I've been wanting fabric with text, like newspaper and such. So I would perhaps get some mix of: Documentation, Subway Signs, and/or Travel Labels (all in Taupe), or Travel Labels in Neutral (which is actually nice muted colors), or maybe Dictionary in Red (although I'd prefer it in B&W). Other possibilities to fill out my dark neutrals: Black Honeycomb Dot (I love dots!) and Grasscloth in Black (such great texture). Maybe I'd pick 5 of those and get a half yard of each. 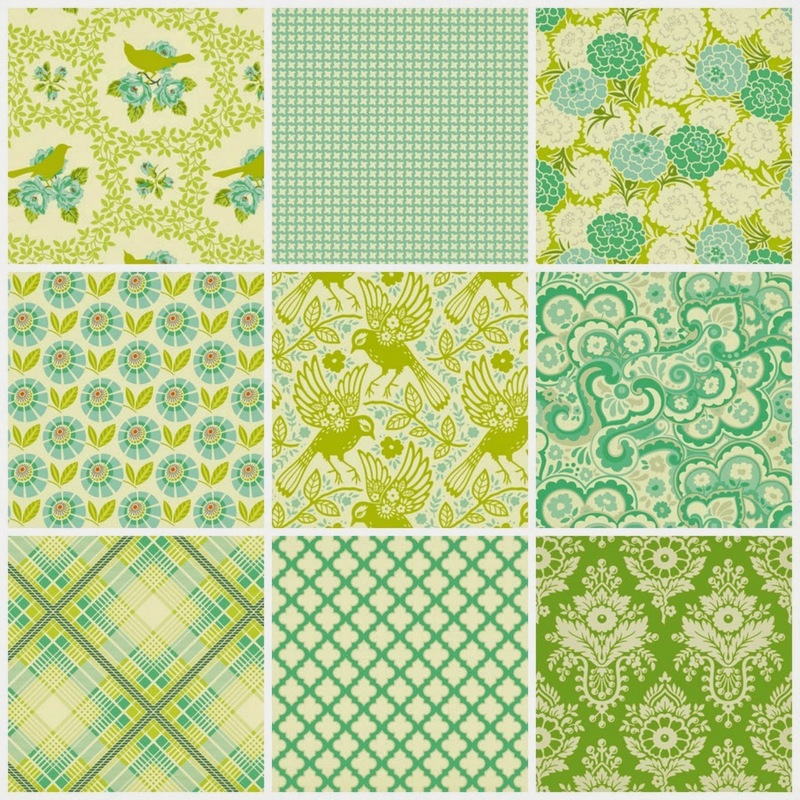 Dragonfly Fabrics have a beautiful Ribbon Top quilt bundle that I would love to make. Thanks for the opportunity. I would put the $25 to a bundle of fat quarters. Today, I am thinking it might be Emmy Grace in Cream or maybe Gray. I know the giveaway is closed. I love the preemie quilts. Two of my grandsons were preemies. I haven't made preemie quilts. I knit preemie hats. Now, I have a new mission. Actually, my stitch group wants to make charity quilts that are larger, Our guild makes quilts for needy toddlers. We think there is a great need for larger children and teens. So we are going to start making at least twin or long twin quilts. I love the rainbow quilt and the medallion in the middle. I'm always looking for ideas for my education segment for guild. I've done it this year and had wonderful comments. I'm not doing it next year. I'm going to be on the programs committee, if nominated. I'm filling out a vacancy. My friend and I each volunteered.